I don't have any data to prove it, but my gut tells me that fancy or hot-rod looking cars are a gleeful target of police. First off, they probably feel relative safety in pulling those cars over, and then there's the "got 'em" factor. In nearly 8 years of having the Atom, 35000+ miles, in just about every state in the continental US, I was pulled over... twice. The first time was in California when it had Oregon temp tags and the second time was in New Jersey quite a few years later. The California stop just wanted to know what it was and chat about the car - we had a great time until their dispatcher radioed them to "wrap it up" because the freeway was slowing down from rubberneckers. The New Jersey one was because the cop (who was a kid less than half my age) mis-read my plate. As he was walking up to me, he was apologizing profusely and saying "I shouldn't have pulled you over, sir - my fault". I've had a number of occasions where a police car has pulled up to me at a red light and asked "is that legal?". My answer of "Got plates!" always seemed to be sufficient. There was this grumpy overweight cop (as you can see in the picture) who decided to try giving me a hard time. But since I was already parked, that doesn't count as "pulled over". And he just told me to leave or he'd claim I was creating a "security incident". 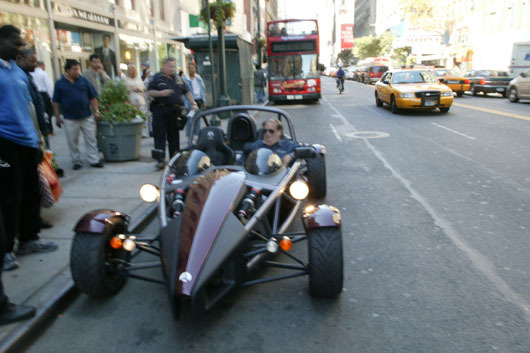 Gotta love NYC ... where else do you see an Atom pulled over in front of the empire state building !! !